The first group had their curiosity satisfied fairly early. A year later, however, the cyber position remains unfilled, even though there’s been enormous activity around the issue of cyber security: international incidents, the establishment of Cyber Command, inter-service rivalries and related budgetary maneuvers, a constant roster of Beltway conferences and task-forces…. Through it all, information-security and network-security professionals kept their heads glued to their screens, working. The work remains, the work of understanding the defensive and offensive realities of the global cyber environment. Now there’s a definitive guide to that work. One of the brightest of a new generation of cyber professionals is Jeffrey Carr, who has long been known in certain circles for his influential IntelFusion blog. He’s just published a great book, Inside Cyber Warfare: Mapping the Cyber Underworld (O’Reilly Media, December 2009). You can buy the book here on Amazon and get a sweet deal, or you can buy the book from the publisher O’Reilly Media and bundle in an e-book copy in a variety of formats. The book covers a dizzying array of topics: the rise of botnets; malware-as-a-service; popular wars fought using civilian networks; fake news sites hijacking real-time feeds; psychological manipulation by cyber means. Jeff is an acknowledged expert, in large part because he’s seen it all through his leadership of GreyLogic and its Project Grey Goose. I was proud that several months ago Jeff asked me to write the book’s Foreword. I did, and you can read it below. Reading it now will save you time when you receive your copy of the book; Jeff received the very first print copy by FedEx today, so yours is now waiting for you to order, hot off the press. Enjoy! During his campaign for reelection in 1996, the Internet-savvy President Bill Clinton used the slogan “Building a Bridge to the 21st Century.” It turns out that the bridge is a cyber bridge, and that malevolent actors can disrupt or destroy the bridge, its cyber traffic, and all who rely upon it. And although it is disturbingly clear that the bridge to the 21st century can be taken out, it is even more clear that we don’t always know by whom or why. Jeffrey Carr’s Inside Cyber Warfare explores why that is so, who the actors are (and their motivations) and the likely future course of cyber warfare in all its manifestations. In part, this book’s value is the comprehensiveness of its coverage, across the spectrum of militarized or warlike computer network operations (CNO). New students of the field—and there are many, in academia, government, and private industry—will benefit from the clear explication of the divisions between computer network defense, computer network exploitation, and computer network attack. Examples abound of each, described in dispassionate, factual prose more helpful than the sometimes frightening headlines in media coverage. 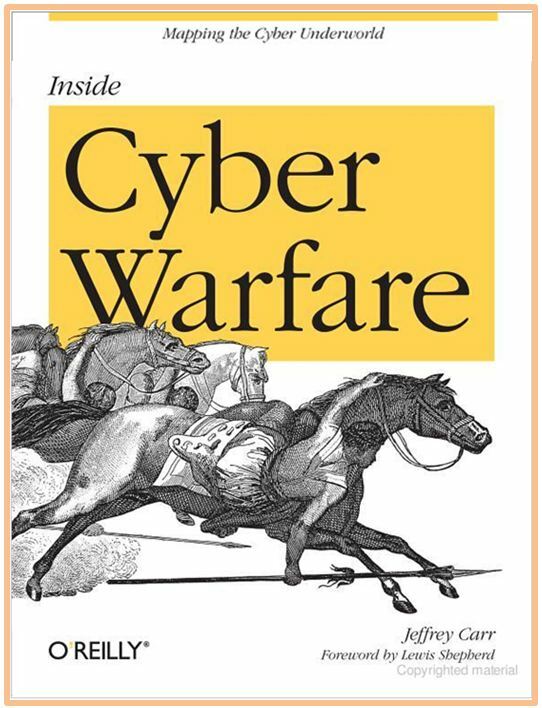 Experts in the field of cyber warfare and CNO will find that these pages are required reading, for Jeffrey Carr has applied an evidentiary analytical framework to understanding the intricacies that distinguish state and non-state actors and hackers, and the varying but discoverable mosaic of political, economic, and social motivations that incentivize cyber warfare. I first became aware of Jeffrey Carr and his expertise while serving in the intelligence community, where like others, I relied on his much-read-within-the-Beltway blog Intelfusion. For this book, Carr’s background is ideal: an early career at the world’s leading software and technology company (Microsoft), his entrepreneurial founding of the highly regarded Project Grey Goose (which I have advised), and the activities of his GreyLogic organization. He now adds to that list the title of “authority,” with its imprimatur stamped by virtue of the pages in this book. Military analysts, pundits, and warfighters alike have known for centuries the Latin adage attributed to “the Roman Sun Tzu,” Publius Flavius Vegetius Renatus, famous for his “art-of-war” classic from 390 BC, De Re Militari: Si vis pacem, para bellum; if you wish peace, prepare for war. Inside Cyber Warfare is the necessary handbook for a 21st century in which all who hope for the new world of cyber-powered peaceful interactions must prepare for cyber war.